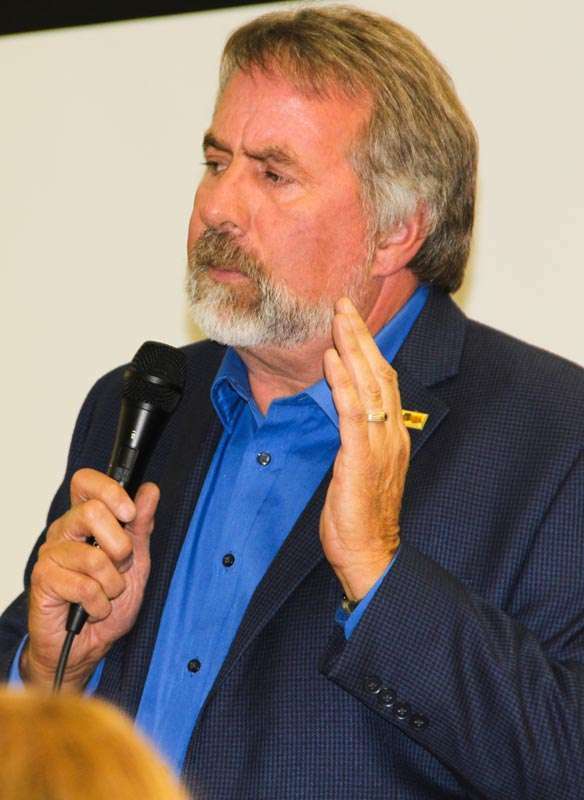 Incumbent Rep. Doug LaMalfa (R-Richvale) talked about his commitment to tax reform, job creation, healthcare options that put choice in the hands of consumers and much more. The yellow school bus parked outside the Graeagle Fire Hall was the first indication that a large crowd was gathering to greet the 1st Congressional District candidates scheduled to appear in a forum hosted by the Plumas County League of Women Voters on Sept. 17. It was the second meeting for Audrey Denney, a Democrat from Chico, who is challenging Doug LaMalfa, the Republican incumbent from Richvale, in two days. Their Sept. 16 forum in Anderson had to be moved to a larger venue, but even that high school auditorium couldn’t hold the crowds who wanted to hear from them. The Graeagle forum drew attendees not only from throughout Plumas County, but from Lassen, Sierra, Butte, and Nevada counties as well. The aforementioned bus brought approximately 40 people from Grass Valley. Lori Simpson, a Plumas County supervisor and president of the League of Women Voters, emceed the event and posed the questions to the candidates. The questions were less about specifics and instead encompassed general topics such as health care, water, global warming and forest health. Simspon told the crowd before the forum to hold applause and comments, including “no clapping, cheering, moaning, groaning,” and for the most part the crowd complied. In addition to opening and closing statements, each candidate was given two minutes to discuss the topics posed by Simpson, which were compiled from audience questions that had been collected on 3×5 cards. The responses were candid and personal. The forum pointed out the differences between the two on a variety of issues. Interestingly, their comments mirrored the brochures they made available to attendees — one packed with facts and specifics, the other a little more generic. Ninety minutes isn’t enough time to capture all the two candidates have to say and what they hope to accomplish in office. More information can be found on each of their websites or reaching out to them directly. Their contact info is provided in this article. 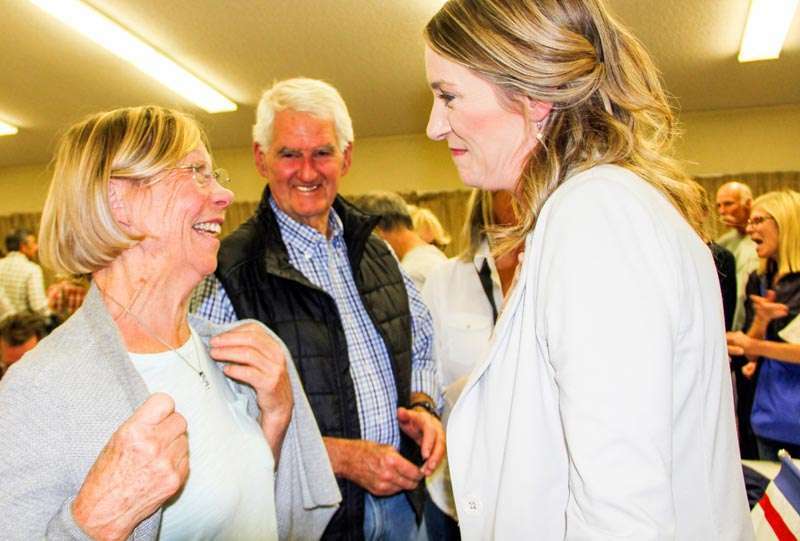 There are some similarities between the candidates — both are tall, come from farming families, reside in Butte County, and profess a desire to serve the citizens of the 1st Congressional District. But then there are stark differences. Doug LaMalfa, 58, the rice farmer from Richvale, served in the state legislature for 10 years and in Congress for three terms. “I have a record, I’ve been around, you know what I’m about,” LaMalfa told the crowd. He touted his work on the Natural Resources, Ag and Infrastructure committees as important to the rural district he represents. Moderator Simpson asked the candidates to talk about health care including pre-existing conditions, the Affordable Care Act, Universal health care, etc. “This could not be more timely,” said Denney who shared information about her recent hospitalization to have a large tumor removed. “I was terrified of cancer; I was terrified of bankruptcy,” she said before discussing the number of people who declare bankruptcy due to medical costs. 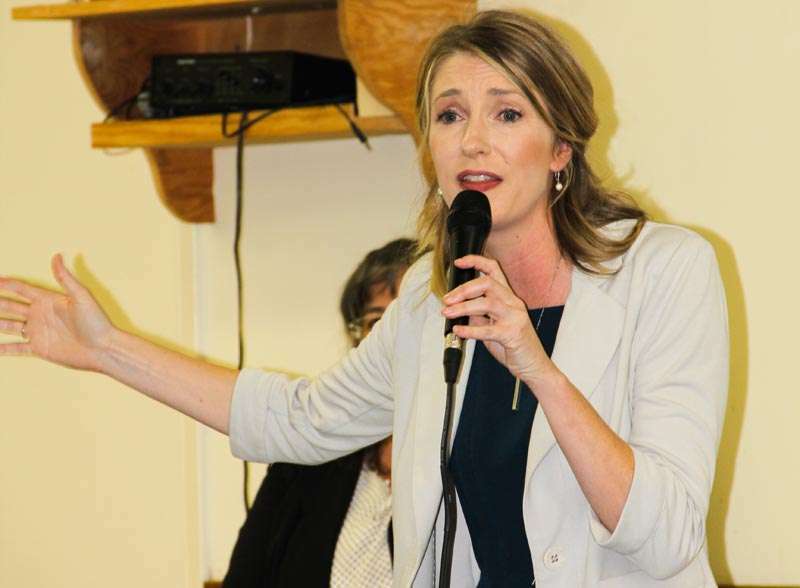 Democrat Audrey Denney spoke with feeling on a range of issues such as the economy, support for agriculture, education, jobs and social safety net programs to protect the most vulnerable citizens in California. Denney attacked LaMalfa’s votes to reduce Medicaid (healthcare for low income individuals) and access to physicians. As for her own position, Denney said that she would like to see Medicare, which serves seniors well, expanded to serve more populations. LaMalfa said that he opposes a government run, single-payer system. He advocates more choices and more competition in health care and said that the Affordable Care Act didn’t accomplish those things. He described the ACA as un-American. LaMalfa said that Social Security is safe for those who are already on it and for those who are close to collecting it, but sometime in the 2030s that wouldn’t be the case. “The younger generation doesn’t believe it will be there for them,” he said and advocated a bipartisan approach to the issue. In this question, the moderator lumped in fire, floods, green technology and more. “Human induced climate change is here,” Denney said, and talked about the need to develop tools to reduce emissions. She said that the federal government must approach the issue as California has. This topic included sanctuary cities and separating children from their parents. He further explained that a distinction needs to be made between “people who want to play by the rules” and those who don’t. “We need a secure border, but a billion dollar wall is ludicrous,” Denney said. She said that the people crossing the border today differ from those trying to enter the country in earlier times. She described the newcomers as women and children, sometimes children traveling alone, who fear for their lives in their own countries. “Putting children in prisons doesn’t make anyone feel safer,” Denney said. She said that LaMalfa has had 10 years in the state legislature and three terms in Congress and was part of the problem. “Send me to Washington and let me take a crack at it,” she concluded. LaMalfa said that the Congress doesn’t receive credit for the bipartisan work it does. “You accomplish a lot more when you find ways to collaborate,” he said. 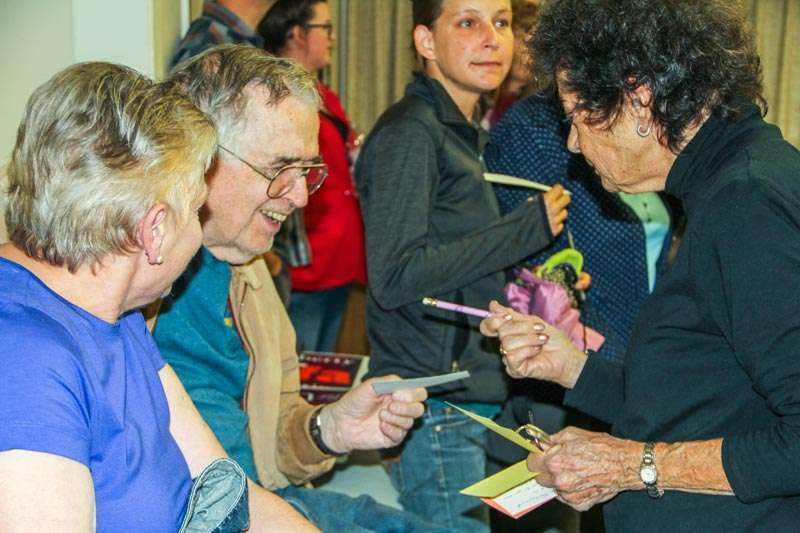 As the capacity crowd searched for seats in the Graeagle Firehouse, Quincy voters Diane Peet, left, and Tom King accept blank comment cards from League of Women Voters member Ruth Jackson, also of Quincy. The audience was not shy about submitting a host of questions on many topics. This topic included the NRA, school shootings, and automatic weapons. LaMalfa touted his A and A+ ratings by the NRA. He said that the right to own guns is guaranteed by the 2nd Amendment and necessary for sports, hunting and self defense, particularly in rural areas. “As great a job as Sheriff Hagwood does, he can’t be everywhere,” Hagwood said of Plumas County’s sheriff. Denney said that she is a gun owner and understands the need for firearms, but “nobody wants innocent lives taken.” She called for sensible laws on the federal level such as true universal background checks, banning bump stocks and expanding gun violence protection orders. This topic included women’s rights, abortion, Planned Parenthood, the Violence Against Women Act (VAWA) and women’s right to choose. LaMalfa said Congress was about to vote on VAWA and that he supported the concept. “We’re here as men to protect our partners,” he said. “I don’t support funding of Planned Parenthood,” he said, adding he would channel that money to rural health clinics. She said that as an Episcopalian she recognizes that abortion is a tragedy, but she supports a woman’s right to choose. Denney said that her faith gives her hope for a better world. 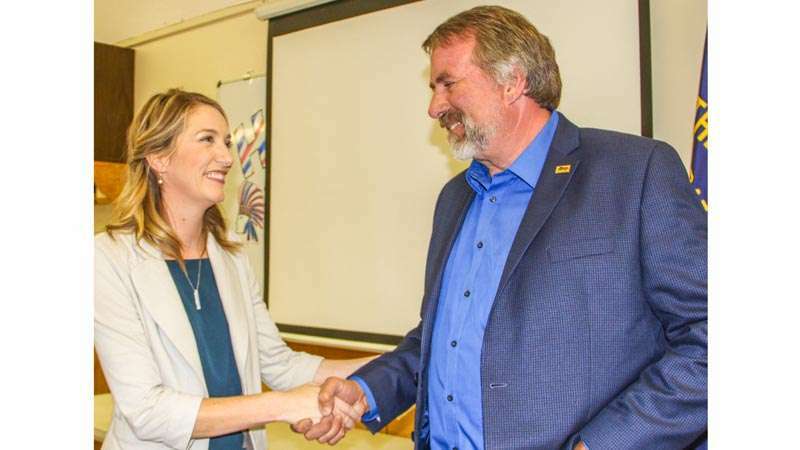 LaMalfa said that “Portola was making good progress” on expanding rural broadband, and described its importance to telemedicine in rural areas. As for secure elections, he advocates showing identification at the polls and reverting to paper ballots. Denney said that broadband is essential for economic opportunity, telemedicine and good jobs. She wants to hold companies accountable to bring fiber optics to rural homes. As for elections, she said that the leadership in the house abdicated the responsibility to the executive branch of government. “In the next 50 days leading up to the midterms, we have to ensure we’re not vulnerable,” she said. Two questions related to the forests — one focused on forest health and wildfires, and the other on access. He said that in the past, the Forest Service has been slow to act, but he thinks that’s changing with the new Agriculture Secretary, Sonny Perdue, who came out to observe the Carr Fire. As for travel management plans and access, LaMalfa said, “They’re public lands, the key word being ‘public.’” He said they should be available for hiking, biking, horses, snow mobiles, and off road where appropriate. He also described the need for firefighters to be able to access the forests, and lamented the lengthy process it takes to accomplish anything on the forest. Denney admitted that as someone who lives in the valley, she is learning about forest issues, but said that she understands the importance of healthy forests to enhance the watershed, provide jobs and reduce fire risk. She said that they must be managed for multiple benefits including timber, carbon sequestration, recreation and endangered species. “I’m glad to support a tax bill that keeps money in your pocket that you earned,” LaMalfa said. He talked about the jobs that had been created, historically low unemployment and a GDP of 4.2. “Middle income America is doing better,” he said. He added that “2 million people rolled off food stamps,” not because they were kicked off, but because they got a job. Voters Davney Gasser of Quincy, left, and Bill Tantau of Clio talk with candidate Audrey Denney after the debate. “Any time. Anywhere. I’m all in,” Denney said. LaMalfa said it has been an honor to serve and to walk the halls of Washington, D.C.
“What is good for the people of the district is good for everyone,” he said. He added that there is more work to be done to make programs better and more efficient. More information on Audrey Denney can be found at audreyforcongress.com as well as on Twitter, Instagram and Facebook. She can be reached by email at [email protected] or by phone at 530-592-0756 or by mailing her at P.O Box 5174, Chico, CA 95927. To find out more about Doug LaMalfa, go to DougLaMalfa.com. His campaign office can be reached by calling 530-712-3675 or by mailing to 1900 Oroville Dam Blvd. E., Suite 12-254, Oroville, CA 95966.